It's the 19th December, it's cold and I have 2 T-shirts, a sweater and overalls on and am working outside on the driveway. With over 1000 miles planned over the Christmas break I decided that I have to fix my EGR problem. 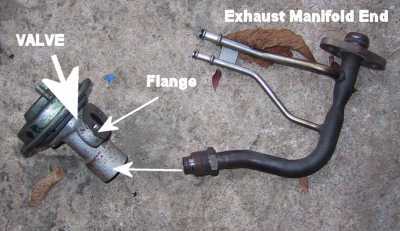 The problem was that the pipe connecting the exhaust manifold to the EGR valve had become loose - resulting in an air leak when the EGR valve operated (on light throttle) and thus a misfire. I had disconnected the EGR mutiplug but was worried that exhaust temperatures would get too high on a sustained motorway run. If you want/need to do this job yourself then prepare yourselves with the following 'special' tools. A 1/4" drive socket set with extra long extension bars. I managed to use 3/8" drive but it was difficult. One point to note is that none of the gaskets are available from Ford individually and need to be purchased as a complete overall kit at £122 - I declined and reused the old gaskets with no apparent problems - fortunately they appear to be of a high quality. 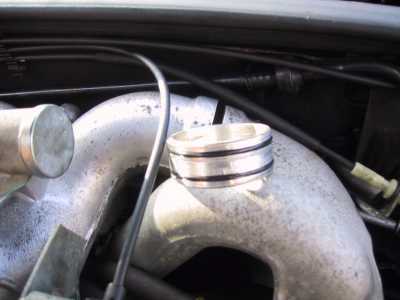 NOTE: The Ford recommended method is that the EGR pipe is replaced every time it is disturbed - but at £112+vat you may want to at least try this method! 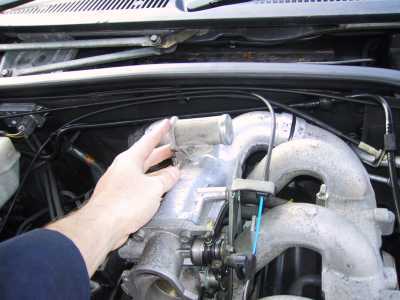 Start by removing the engine cover and disconnecting all of the pipes and hoses from the left hand inlet manifold. I also found it easier to remove the air inlet plenum and trunking and the spark plug leads for the right hand cylinders. Slacken the clips for the VIS and pull it off away from the inlet manifolds. Be very careful with the rubber sleeves that hold the VIS and also the left hand inlet manifold to throttle housing. They are £18 each to replace! Slacken the Inlet Manifold bolts in turn - the one that sits under the throttle body is a real pig - I used a ring spanner and large screwdriver to lever the spanner until it moved. Removing the plastic throttle housing extension helps and this is where you will need your 1/4" drive and extensions to get to the bottom 8mm bolt that holds the plastic housing in place. The Inlet manifold can now be lifted away and hopefully the gasket is in good condition. Wipe the gasket gently with Carb Cleaner and place the manifold somewhere safe. Next disconnect the two throttle cables (easy) and unbolt the throttle body from the retaining plates (don't drop the bolt into the engine as I did as it's a pig to retrieve). The Throttle Housing is now held in place just by the EGR pipe and you need a 10mm socket to undo the pipe at the EGR valve flange. With the Inlet Manifold removed there is fair amount of room. When loose remove the gasket and bolts - again the gasket is not available so retain the old one. You can now remove the Throttle Housing and clean it with carb cleaner. The EGR valve is removed with its pipe from the Exhaust manifold end and if you have a friendly Gynecologist then now is the time to employ them. Getting access to the nuts is a desperate job and will skin your knuckles and cause a temporary loss of sanity. Eventually with your extra long socket extensions you will work out how to remove them and when you have retrieved them from where they fell off under the car you can remove the EGR valve complete with it's pipe. The offending article - both ends were loose and leaking air and as Ford decided that they wanted £125 for a replacement I went to my local plumbers. The joint at the exhaust pipe was just in need of a clean and polish with emery paper but the other end was where the pipe had flared and the olive jammed. Attacking this with a blowtorch enabled me to remove the old olive and polish the pipe with emery. The old olive is stainless steel but I couldn't find them anywhere so used a 40p brass olive which should outlast the car. Fit the pipe to the EGR valve loosely and install the unit back onto the exhaust manifold. 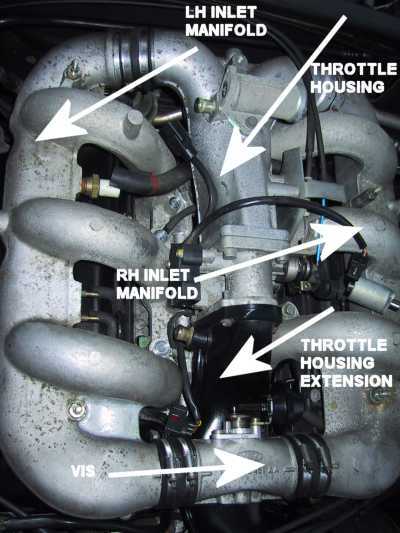 Twist the valve so that the flange is vertical - use the throttle body to align the two flanges and check that the throttle body aligns with the RH inlet manifold. Then carefully remove the unit and tighten the pipe to EGR valve joint fully. The pipe should not be able to be moved at this point. Install the unit and tighten the pipe to exhaust joint hand tight. Again try a fitment of the throttle body to make sure that you are in alignment and then fully tighten the flange at the exhaust pipe. There is a small cylinder that fits between the throttle body and the RH inlet manifold - it uses 2 O rings to seal the gas and these must be replaced (they only cost £2 apiece) - If you don't then you will get an air leak and have to strip it all down again (Grrrrr!). Coat the O rings with clean engine oil and install the Throttle housing and reattach the bolts to the throttle cable plates and reattach the throttle cables. If you have done it right then the flanges at the EGR valve should be in alignment and you can now refit the gasket and bolt them together. I needed a small tap with a mallet and piece of wood on the EGR valve to align them and it didn't appear to do any harm to the sealing of the pipe but be careful. You can now reinstall the LH Inlet manifold, aligning it with the throttle housing and with it's rubber sleeve in place. Tighten the bolts not forgetting the one underneath the throttle housing which needs the ring spanner. Don't install the VIS yet, tempting though it is to do so. Reconnect all of the pipes and multiplugs and then the plastic inlet housing to the throttle body - again the 1/4" extension is needed as you install the lower bolt first. Now you can install the VIS - place one rubber sleeve in place on the RH inlet manifold and secure with it's clip. Coat the inside of both sleeves with clean engine oil and insert the VIS into the right hand sleeve - don't use a clip just yet. Carefully squeeze the left hand sleeve through the gap between the VIS and the LH inlet manifold and wriggle it into position - the oil helps but don't tear it or you are £18 poorer. Finally secure the remaining 3 clips and tighten. Reinstall any of the air inlet ducting that you may have removed and the plug leads and finally the engine cover. Job done - start the engine and using a piece of plastic tube listen to each of the joints on the inlet manifolds for any air leaks - you can dribble a light oil around them and rev the engine, watching for oil smoke (not steam) if you suspect a leak. 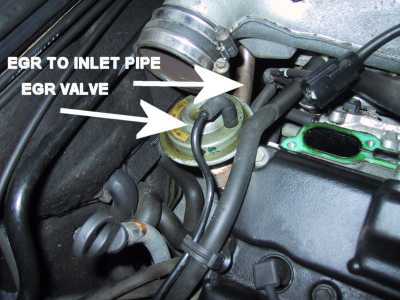 Note: repair did not work as the angle of the pipes appears critical and has resulted in an air leak - I have therefore disconnected the EGR system by plugging the vacuum pipe that leads to the EGR valve until I can try again.